Atrocious wet weather meant that the lawns at Park Place were waterlogged at the weekend and our annual summer fete had to be postponed. 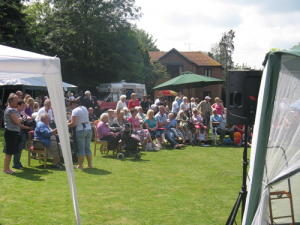 The event will now be re-arranged as the fete is a highlight in our village social calendar, as this picture from a previous year clearly demonstrates. In the meantime, residents find time to meet up for an informal game of croquet on the lawn – when the weather is kinder! They also organise regular afternoon teas which they take turns to host.